Other distinguished nominees include BLP amongst others. Other distinguished nominees include Clyde & Co and Magnusson amongst others. Other distinguished nominees include Bird & Bird, CMS and Mayer Brown amongst others. Other distinguished nominees include Appleby and BLP amongst others. Other distinguished nominees include Allen & Overy amongst others. Harvard Business Publishing, Google Enterprise and the Financial Times are just a few of the prominent sponsors of the MPF Awards. The awards ceremony will take place in London on 11 March 2015. 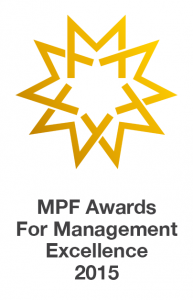 Now in its 13th year, the MPF Awards for Management Excellence are an integral part of the MPF International Management Excellence Summit, in association with Harvard Business Review, Financial Times and Google. The Awards were created in 2002 as a way for the management of professional firms of any size to directly demonstrate their contribution. The Awards involve formal assessment by independent management experts across five priority areas: leadership; collaboration; operational excellence; commerciality; and capabilities.